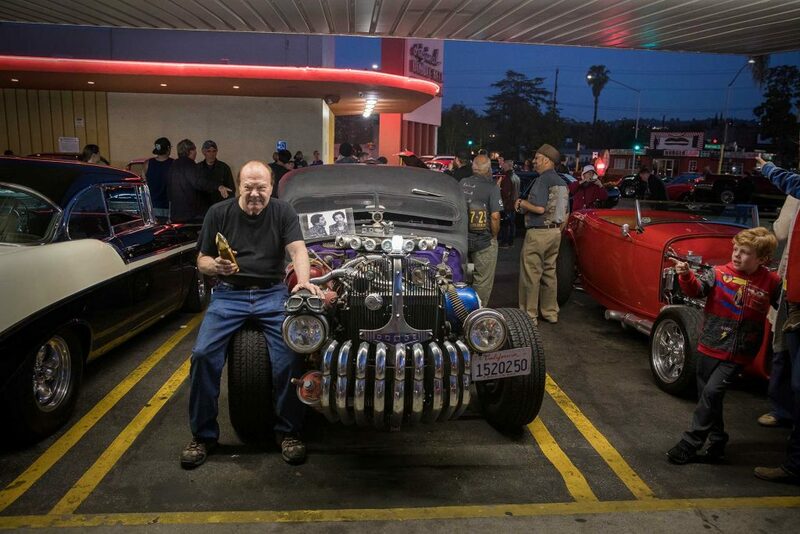 Friday nights at Bob’s Big Boy mean retro hot rods and local legends. “I’ve been coming to Bob’s since ’58. There are a lot of new, different people all the time. We met people from Germany last week. If you come to California and you’re going to be in L.A., it’s like going down Hollywood Boulevard and seeing Grauman’s — go to Toluca Lake to Bob’s.” — Rick Nightingale from Sherwood Forest, with his 1932 Dearborn roadster. Photo by Daniel Deitch. You never quite know what you’ll see at the weekly classic car show at Bob’s Big Boy in Burbank. Auto enthusiasts start gathering as early as midafternoon each Friday in the parking lot off Riverside Drive to stake out the best spots for the event, which officially runs from 4 to 10 p.m. and draws car collectors, hobbyists and sightseers from all over Southern California and beyond. While a core group of regulars attends nearly every week, others show up periodically with a rotating roster of cars (and often motorcycles as well), ensuring a fresh mix of original and modified vehicles from early Model Ts and ’50s convertibles to ’70s muscle cars, plus rarities and oddities that defy description. Any given night might include a famous car like the Batmobile, or a famous car aficionado such as Jay Leno. During three successive visits in April, we spotted film and photo crews, a local politician campaigning for office, and even falcon handlers (from Winged Solutions in San Dimas) introducing their birds to passersby.While there’s always something new to encounter, at heart the event is a journey back in time to the era when these classic cars were new, when local teens met up at Bob’s after football games and drag races were customary. Many of the regulars who settle into lawn chairs on the parking lot’s perimeter to talk shop and swap stories with old friends remember those days and will happily reminisce. A walkup counter open only on Friday nights serves up Bob’s beloved shakes and burgers; music wafts from open car windows, punctuated by the revving of superpowered engines; and families stroll the lines of vehicles, picking up technical and historical factoids from the assembled experts eager to share their knowledge. 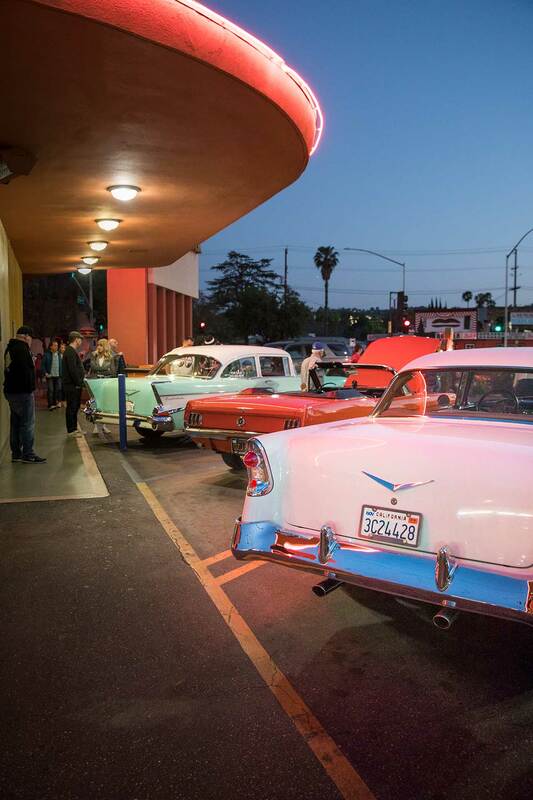 Whether you’re a diehard gearhead or just a casual appreciator of bright colors and shiny chrome, a neighborhood resident or a tourist, the Bob’s Big Boy car show is an essential summer evening activity and a perfectly preserved slice of Southern California life. 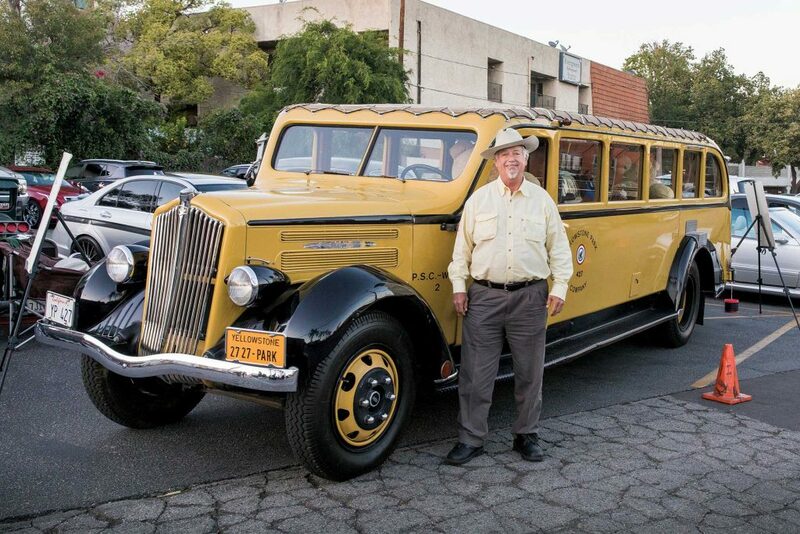 Mark Miller from Thousand Oaks spent five years rebuilding and restoring this rare 1941 Willys Plainsman. What keeps him coming back to the car show is “all these old people, and then the young people who need to see stuff like this,” he says. “This is us, this is our time. I’m brain-damaged from the Marine Corps; I lost a bunch of years, so I talk about the things I know. I don’t know how much time I’ve got left. But as long as I can, I bring the car out with a couple of my friends. Everybody out here appreciates this stuff.” Photo by Daniel Deitch. 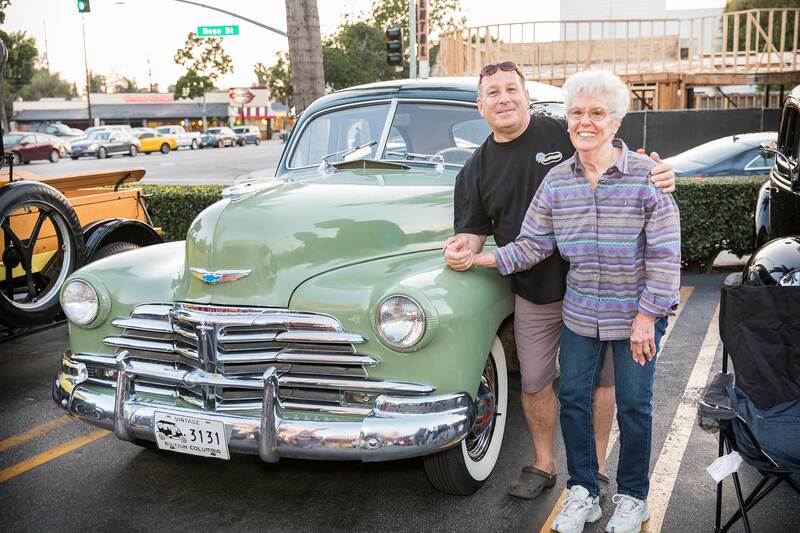 Wanda Lisa and her son Louie, both from Sunland, with their 1948 Chevy Fleetmaster, which Wanda inherited from her family and passed along to Louie when she retired from driving. “I’ve been coming here ever since they had a car show,” she remembers. “My husband and I used to come all the time before he passed away in 2015. Now I come with my son.” Both agree that what keeps them coming back is the people — plus, Louie adds, “We go for dinner. You can’t beat the old Bob’s Big Boy hamburger.” Photo by Daniel Deitch. 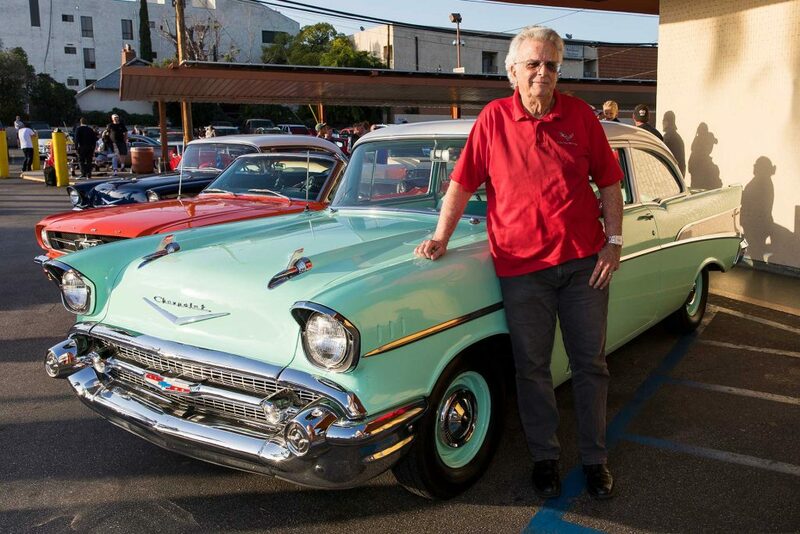 Larry Gillins of La Cañada with his 1957 Chevy. “This was a gathering spot every night for Burbank and Burroughs [high schools],” he recalls of that era. “After every football and basketball game everybody came here to hang out, meet friends and make new acquaintances. Everybody came to see the cars.” Photo by Daniel Deitch. Larry Gillins can point out the exact spot in the Bob’s parking lot where, in 1960, his life changed forever. He was just a few years out of high school when he spotted a cheerleader he recognized: “I saw her sitting right down there in her dad’s Buick with another pretty blonde and said, ‘Hey, that’s that cheerleader. I’d like to take her out.’ So we walked over; she had a four-door car, and my friend and I, we just jumped in the back seat and said, ‘Hey, how are you?’ So that’s how we met, and then we got acquainted. I drove a nice car they liked. I took her out and we got married about a year and a half later.” The couple now has six children and 19 grandchildren, and they still love classic cars. 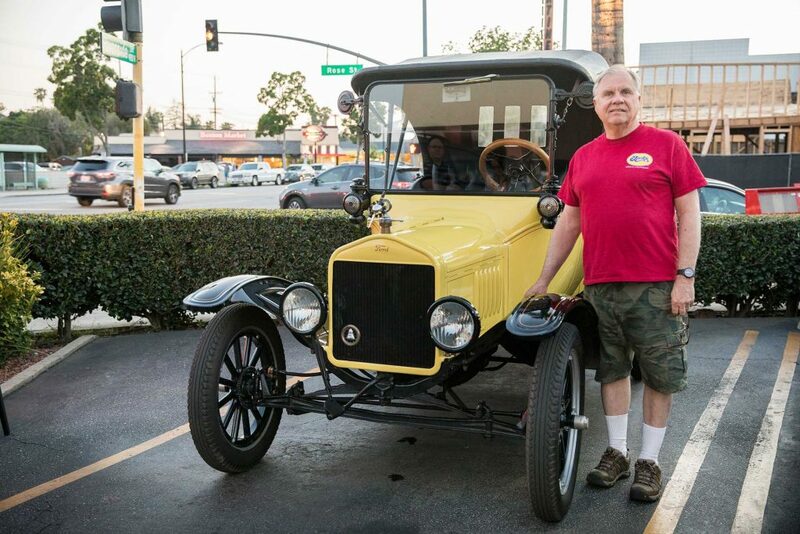 Bob Jorgenson of Glendale with his 1919 Ford Model T Roadster pickup. “It’s a slow car, it’s a 35-mile-an-hour car,” he says. “But when you have a car like this, you see so much driving down the road at 25, 30, instead of whizzing by at 55, 60. It’s a roadster, which means the top goes down, so during the summer it’s the greatest thing in the world.” Photo by Daniel Deitch. 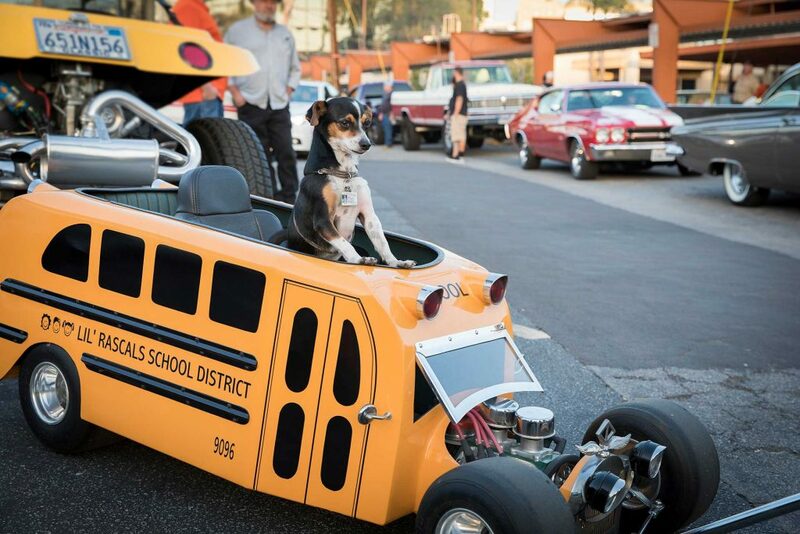 Homer, a 2-year-old rescue dog, stopped by the car show in his custom-made school bus. 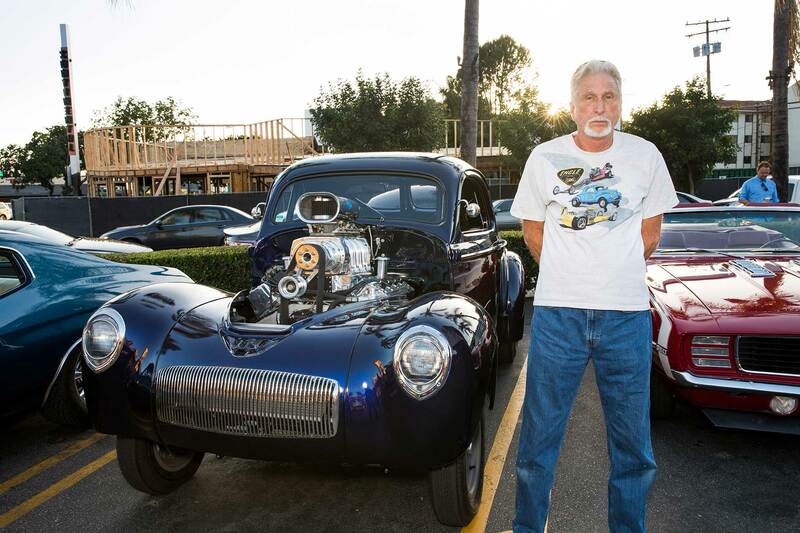 “I’ve been building little cars for about 20 years,” says Homer’s owner, Sergio Prado of Henry’s Upholstery in La Habra, who shares his creations on Instagram. In an array of painstakingly detailed and wildly creative mini-vehicles that include Herbie the Love Bug and a vintage Volkswagen bus, Homer spreads joy at local retirement homes and appears at car-related events. Photo by Daniel Deitch. 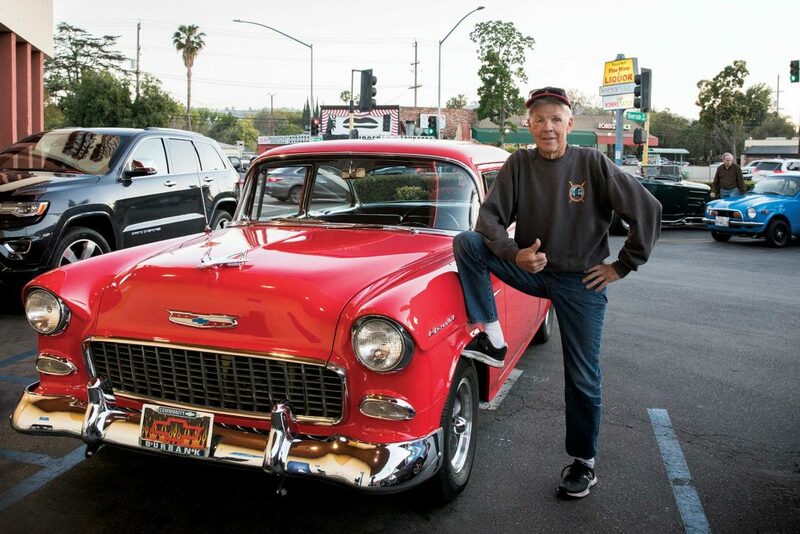 Bob Kindoll of Quartz Hill, posing with his 1955 Chevy 210, says: “I’m a gearhead once and forever. A Burbank kid. I came to this Bob’s in 1949 holding my mom’s hand.” Asked what he likes most about it, he says, “The feeling of camaraderie and the people you meet, and the old cars. We like the food — it’s old-school, and it’s still kind of the same. The building is the same and the feeling is the same.” Photo by Daniel Deitch. Brad Boyajian with his 1937 White Model 706 Yellowstone Park bus, which carried sightseers on tours through the national park until the 1960s. “It was a challenge,” he says. “I spent about eight years restoring it and spent the next 10 tweaking it, and now we take it around and show it. We trailer it to Yellowstone every other year, tour the park and stay at the hotels. There were 98 built and 72, I think, that are left.” Of making the trip from Chatsworth, he adds, “It only goes 40 miles an hour, so it’s hard to get across town.” Photo by Daniel Deitch. Rich Matthews and his 1940 Dodge rat rod pickup truck. It took him four years to put together the one-of-a-kind mobile art assemblage, which includes memorabilia from his 1960s New York motorcycle gang days. He’s been attending the car show for five years, encouraging passersby to take photos sitting in the truck and kids to blare the horn. “I love this place,” he exclaims. “It’s free; I come down and meet all my friends. I work all week long, I come here, and it’s like a party every Friday night. I’ve been in four movies. My old car never got this kind of attention before! It’s amazing!” Photo by Daniel Deitch.